The Fast Healthcare Interoperability Resource is a proposed data standard developed by HL7, a healthcare IT standards body. HL7 has long provided comprehensive frameworks and standards required for the integration, exchange, and retrieval of electronic health information. 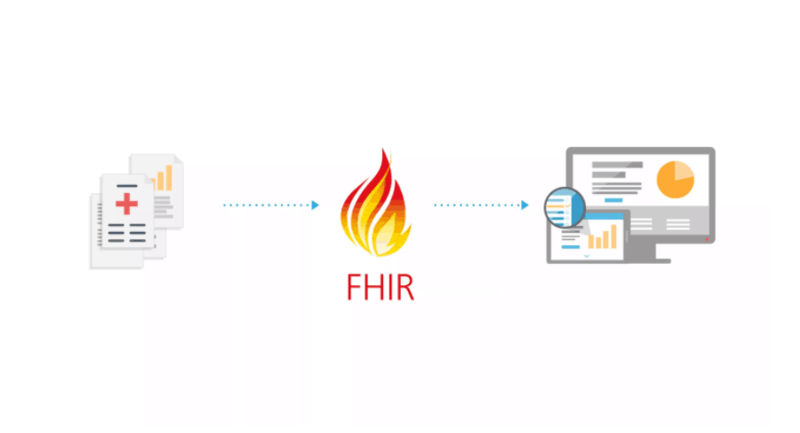 FHIR was created with keeping the complexity and the sheer amount of healthcare data in mind and it takes a new, web-based approach to connecting discrete data elements. Data elements, also known as ‘resources,’ have a tag that acts as a unique identifier, much like the URL of a web page. This approach, actively used by the likes of Yahoo, Google and Facebook, makes it easier for distant systems to exchange specific, discrete pieces of information rather than entire documents. The amount of healthcare data present today is enormous and most of it can be traced back to paper records. Owing to this, the majority of health information exchange and interoperability is document-based. The data is communicated through fax, emails, or sent electronically and is relatively static, demanding a special effort to extract the underlying information and make it usable in any other format. Even with electronic mediums, the transfer can be inefficient. For instance, a commonly used standard for document transfer: C-CDA, or Consolidated Clinical Document Architecture, is a standardized document format that is capable of sharing critical information but is designed only to transfer entire documents, rather than selected data elements. Much like PDF, the data is relatively static and takes extra efforts to make use of the information. FHIR uses standardized application programming interface (API) standards and allows developers to create and customize plug-and-play applications, which can be plugged into any EHR and will feed information directly into the provider workflow, eliminating gaps and pitfalls that may take place in a document-based exchange. FHIR has a data-level access approach and offers access to even granular data. What FHIR means for patients and providers? Several federal agencies, including the Office of National Coordinator for Health IT, have great expectations from FHIR. The instances and applications are limitless, and FHIR is all set to counter significant challenges like improving patient engagement, developing robust care management programs, designing population health management programs and offering valuable insights at the point of care. Several value-focused organizations and health IT vendors are using FHIR to expand their population health management initiatives and create specialty-specific data exchange programs that connect disparate data sources and offer real-time data access for providers to improve clinical decision support. Along with improved patient engagement, reduced cycle time and easy data exchange, providers can leverage FHIR to enable patient access to data under the guidelines of Meaningful Use and MACRA. As for patients, FHIR solves the issue of having multiple portals to contact their providers. Situation-specific, granular FHIR programs can perform analytics on acquired patient health information from EHRs, wearable devices, glucose monitors, fitness trackers and deliver a holistic view of all medications and episodes. Patients can have access to this complete holistic record, shared among their providers, and utilize that to improve care management. What FHIR means for healthcare data monitoring? With more and more healthcare data coming up on the front lines with each passing second, providers need to find new ways of monitoring and deriving insights. Healthcare data monitoring can be enhanced with the use of FHIR, as it enables focused access to data and saves bandwidth and time. FHIR systems can support a range of applications and can turn data from multiple sources into actionable insights. With increased access to data and seamless exchange, providers can run analytics and learn about their growth opportunities and shortfalls in their organization’s performance. What are some current and future applications? Currently, the focus on interoperability is significant, and as value-based care expands, both payers and providers will be looking for secure and efficient ways to connect with other network stakeholders. So far, FHIR has been addressing several business needs by providing granular data-level access over a document-based exchange. FHIR proposes a smarter way to use technology by building on existing standards. A new initiative, SMART on FHIR allows more robust, third-party functionality and a creative use of data within the EHR itself and offer access to discrete clinical data. Other technologies like RESTful, JSON have already made an impact on several data exchange space. The promises of FHIR are numerous, and the aim is one- to create a strong data standard across the care continuum. There are yet many innovative ways to develop that will address the fundamental challenges of healthcare data interoperability, but the rate at which ideas are emerging and outreach is growing, FHIR could reshape healthcare in a blink!